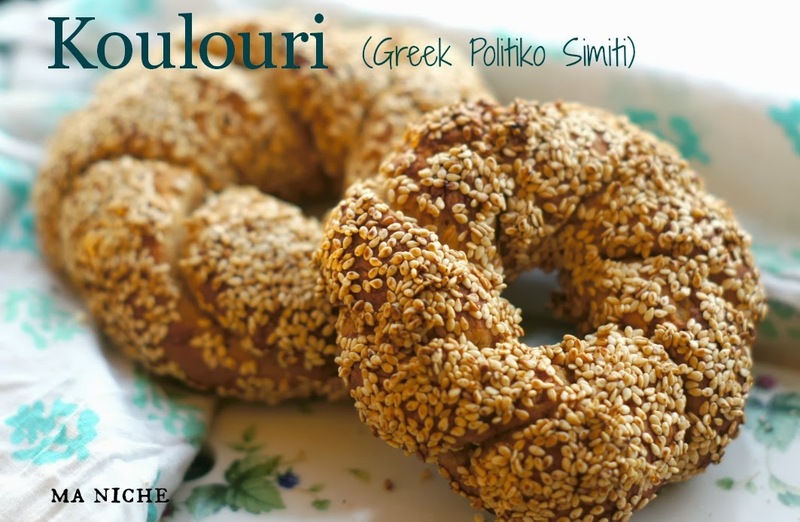 Koulouri is a sesame crusted bread ring from Greece. It is a street food sold by the vendors in Athens. Apparently it is a common snack for both Greeks and Turks and is believed to have been brought to Greece by Greek refugees from Asia Minor and Constantinople(Istanbul). In Turkey they go by the name of Simit or Susam kebabi meaning Sesame kebab. 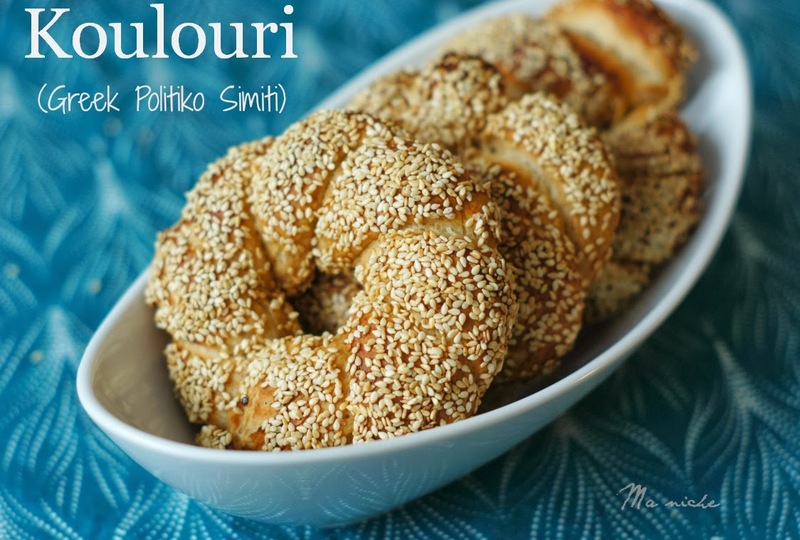 Though a derivative of the Turk Simit, the Politiko Simiti is quite distict from it. 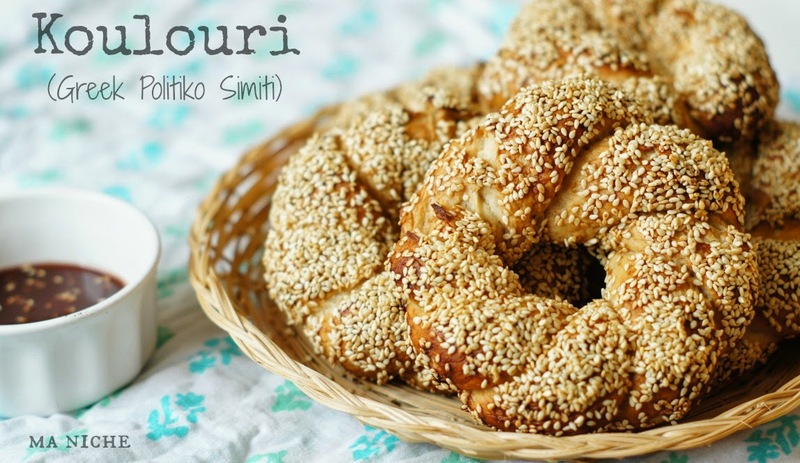 It is braided and given a generous coating of petimezi(Greek grape must syrup or grape molasses) before being rolled in sesame seeds and baked. The braiding lends a bagel-type texture to the Koulouri and the grape molasses gives it a mild sweetness, thereby making it a popular breakfast bread or teatime snack for the Greeks. But... in case you want to make the grape syrup my way here is how you can do it. For 2 cups of grape syrup, blend 5 cups of red grapes, strain the juice into a large saucepan. Over medium heat, bring the juice to a boil, skim off the foam that rises on top and simmer over medium low heat for the next 1½ to 2 hours, until the juice thickens and acquires the consistency of honey. This syrup can be used as a dipping syrup for the bread or served as a sauce with savory snacks. It also tastes good when served over Greek Yogurt or Frozen yogurt. Now the recipe for eggless Koulouri... It tastes best when hot and fresh. Heat the water and milk together till the mixture is lukewarm. Put the water-milk mixture along with all the ingredients for the dough in the pan of the bread machine in the order recommended by the manufacturer. Program the machine for dough cycle. After 10-12 minutes, feel the dough with your hand. The dough should be smooth and elastic, it should not be sticky. Adjust the water and flour levels accordingly and let the dough cycle complete. While the machine is running, toast the sesame seeds. Put the sesame seeds In a large frying pan and stirring constantly, toast the seeds over medium heat until they become golden brown in color and release their aroma. Keep the toasted seeds aside till ready to use. When the machine cycle completes, turn the dough into a lightly floured surface, divide it into 6 equal portions and shape the portions into balls. Preheat the oven to 400 °F and line two baking sheets with parchment paper. Take each ball of dough and roll it into a 50-55cm long rope. Bring the two ends of the rope together and braid the two strands , then form a ring and press the two edges together. Once all the dough balls have been shaped into braided rings, working one at a time, dip the rings in the grape syrup, coat them well with the syrup then immediately dip them in the toasted sesame seeds, coating each one of them thickly with the seeds. Place the coated rings on the prepared baking sheets and bake in the preheated oven for 20-25 minutes, until they turn golden brown. Cool the baked simitis over cooling racks and serve them warm or at room temperature. These buns are being yeastspotted. wow wow that a fantastic bread :) looks so very pretty !! and so perfectly done dear !! These are such amazing bread!! I didn't know that Greek's had a bagel. Love all the sesame seeds. One of my husband's colleague made the same remark . I guess it is not so well-known outside Greece.